I spend a majority of my time with fellow twenty-something artists. We have interesting conversations, go see the wonderful cultural offerings in the city, and offer moral support when we feel creatively blocked. We are also frequently strapped for cash. For this reason, we tend to give each other edible gifts, rather than dishing out precious dough for a nice store bought present. A good friend got a group together for birthday drinks the other night. I didn’t want to arrive empty handed, so I decided to bake her a little something. 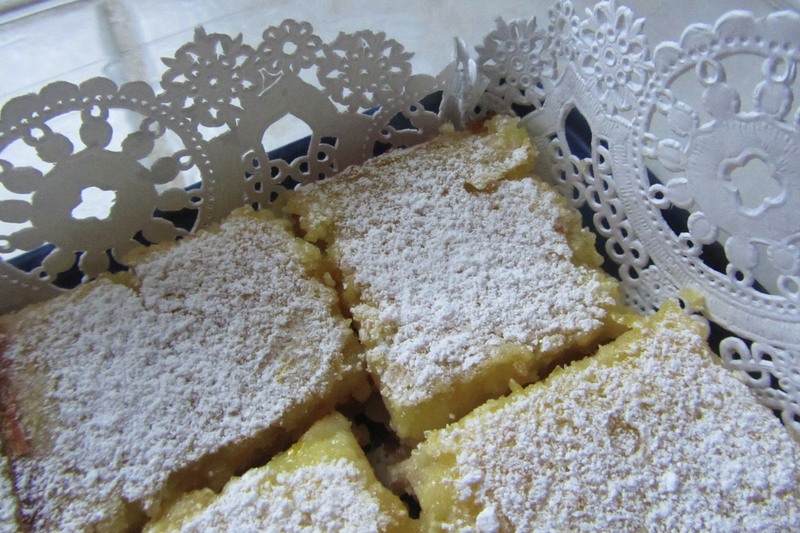 I ended up making some zesty lemon bars, per her request. 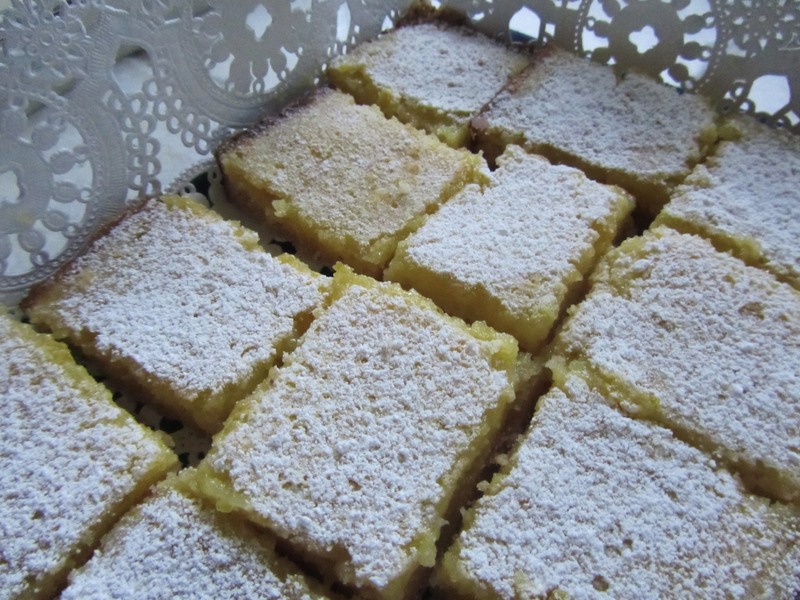 Shockingly, I had never made lemon bars before! 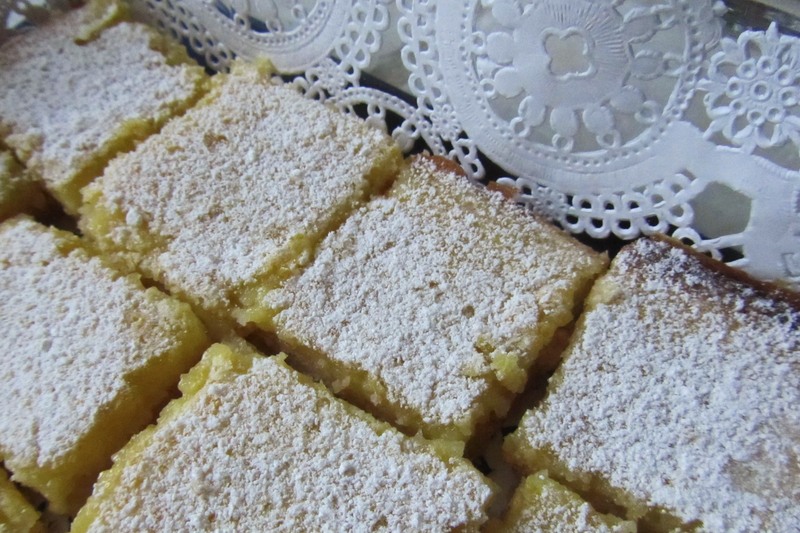 I once made lemon bars from a mix that Mom had, but I don’t count them. 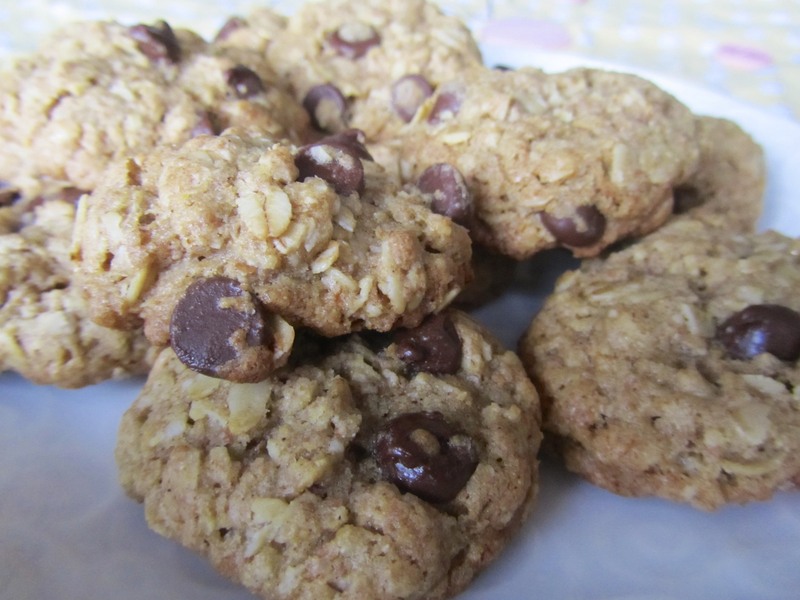 This recipe was really simple, and the result is delicious! The only adjustment I made was adding a bit of whole wheat flour to the crust, which, honestly was because I ran out of all-purpose flour. I recommend the change, though. Preheat oven to 350F. In a large bowl, beat butter with an electric mixer on medium to high speed for about 30 seconds. 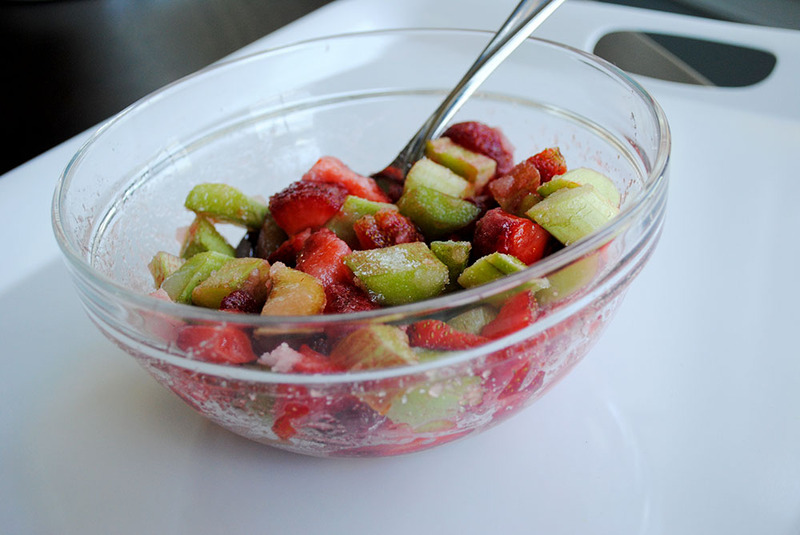 Add the 1/4 cup of sugar, and beat until combined. Beat in the flour until mixture is crumbly. 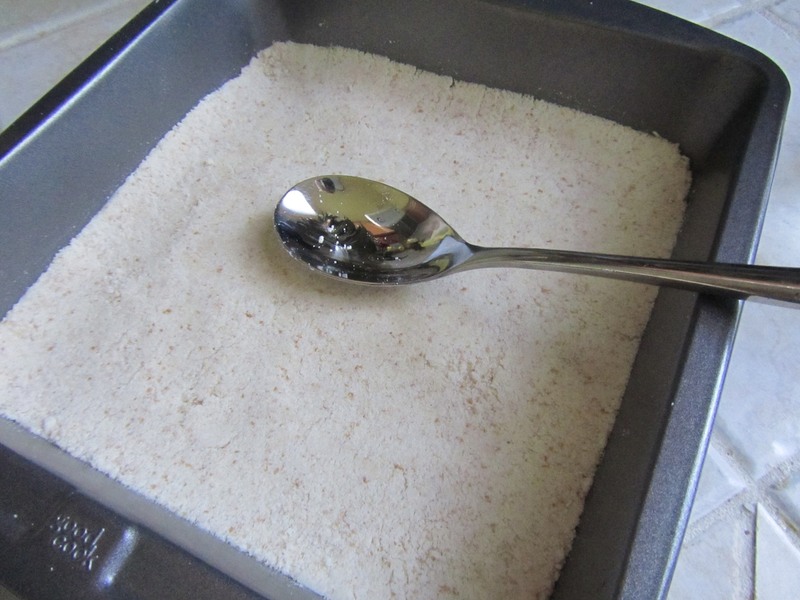 Press into a 8x8x2in baking dish, smoothing with the back of a spoon. Bake until golden, 15-18 minutes. While the crust is baking, combine eggs, sugar, flour, lemon zest, lemon juice, and baking powder. Beat until thoroughly combined, about 2 minutes. Pour filling mixture over hot baked layer and return to oven. 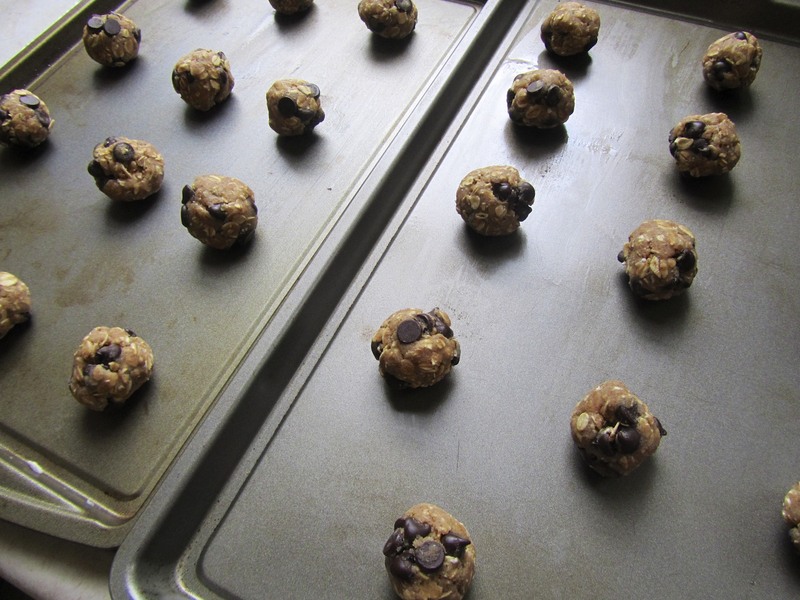 Bake for 20 minutes, until lightly browned around the edges and set in the center. Cool completely on a wire rack. Sift powdered sugar over the top, if desired. Cut into 20 bars. While digging out my apron, I also come across a package of doilies. I was so excited to be able to present my bars on something prettier than just a tupperware container! I’m trying not to read into the fact that I had doilies lying around… What a little housewife (minus the whole husband thing)! The bars were quite a hit. We were also lucky enough to have a batch of brownies, provided by another friend. We were that super cool group with homemade goods at the bar. We got a few dirty looks, but I prefer to think people were just jealous. I’ll need to remember these next time I feel like baking, but don’t want chocolate (it happens once in a blue moon). 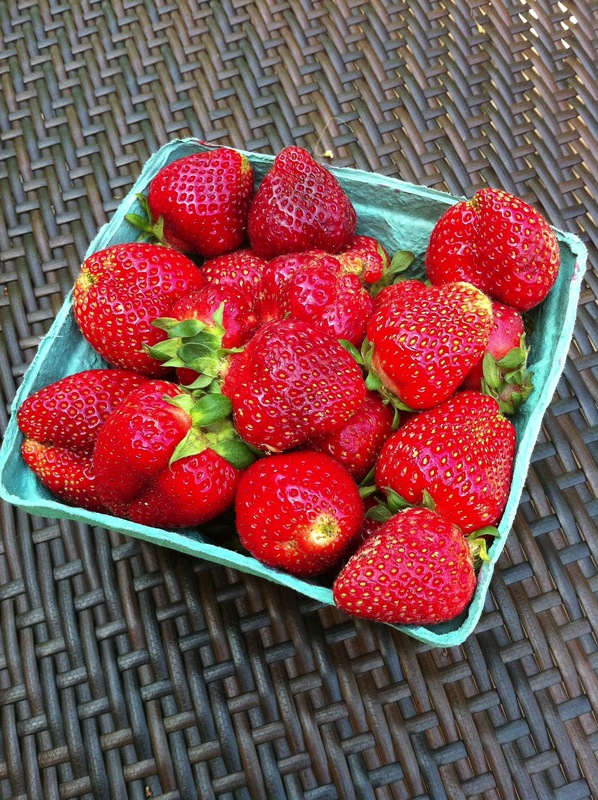 They were smooth, sweet, and tangy! Yum! 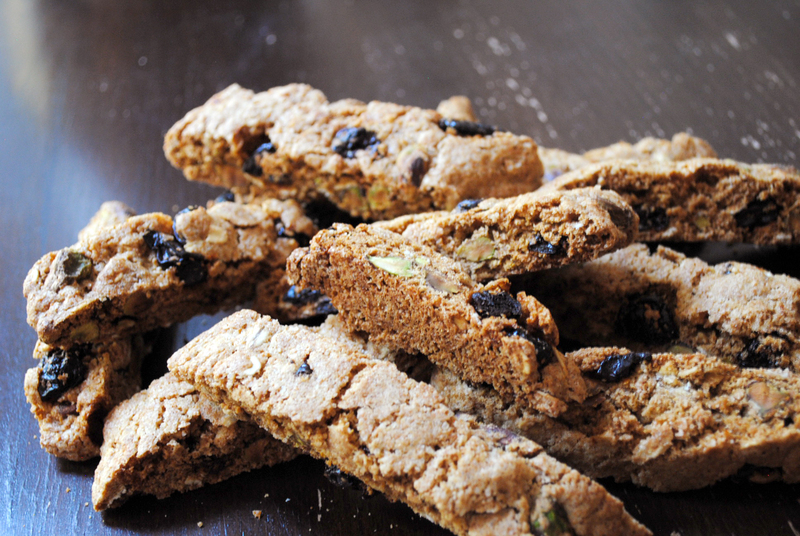 I love biscotti as an afternoon or after dinner snack, especially with a latte or a glass of almond milk. 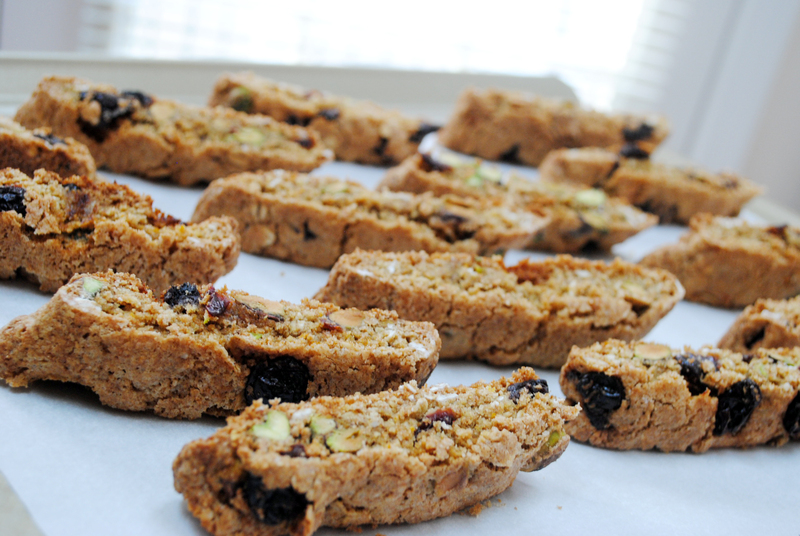 I went through a phase when I lived in New York where I ate biscotti on pretty much a daily basis. Trader Joe’s makes a tasty chocolate dipped variety, and almost every coffee shop sells biscotti. But I had never made my own until this weekend. 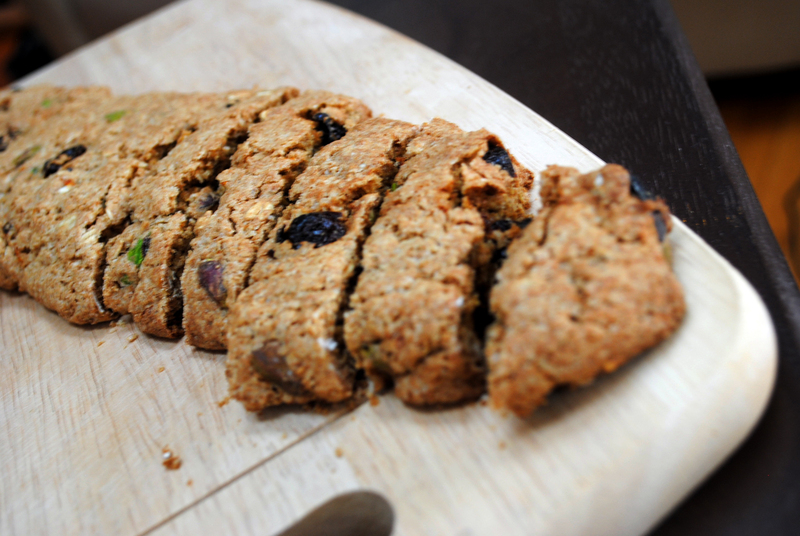 Biscotti are twice-baked cookies. 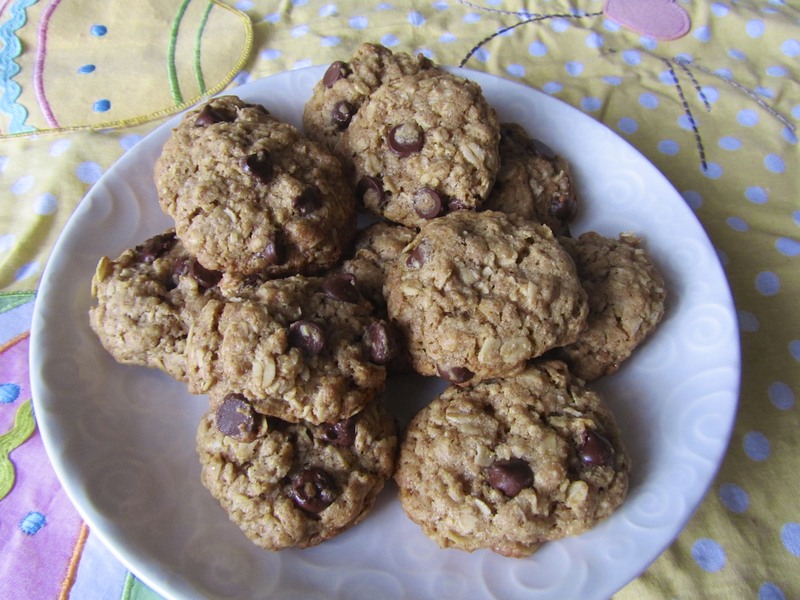 If you sample them after the first phase of baking, they taste just like a typical crunchy on the outside, chewy on the inside cookie. 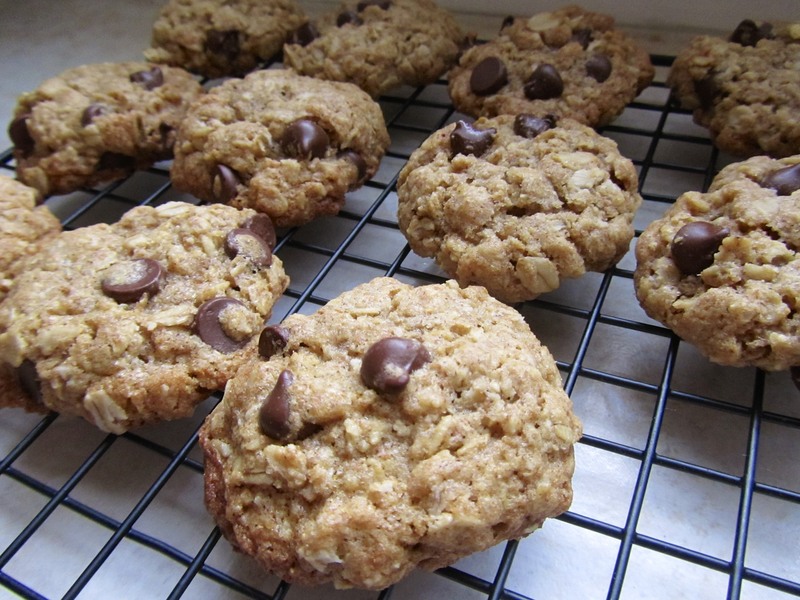 The second phase of baking makes them super crunchy and perfect for dipping. As part of my New Year’s Resolution to learn more about the ingredients I use, my first rule is “no assumptions.” I will not assume I know about an ingredient, but rather, I will research all key ingredients to really learn about them. For example, I know that pistachios are those little green nuts that typically come in shells (unless you have bulk bins that sell them already shelled! ), and are lower in fat than other nuts. But how do they grow? What vitamins and minerals do they contain? Pistachio: Cultivated in California, Turkey, Italy, and Iran, pistachios are an important culinary nut that has been used for thousands of years, as far back as 6750 BC. 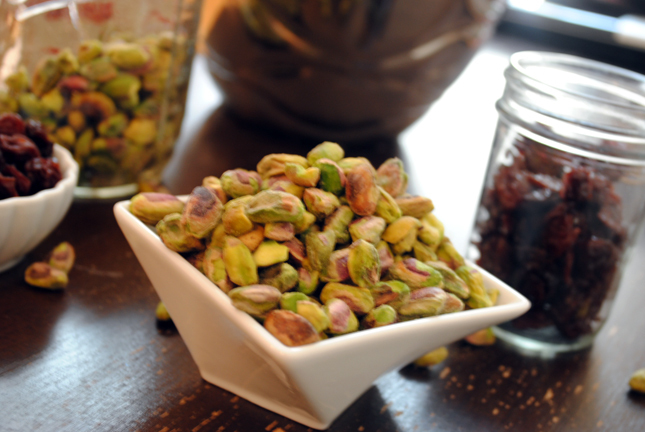 In the U.S, pistachios have been cultivated as a commercial crop since the 1930s. The pistachio nuts we eat are the seed of the plant, contained within the hard, whitish/beige shell of the fruit. 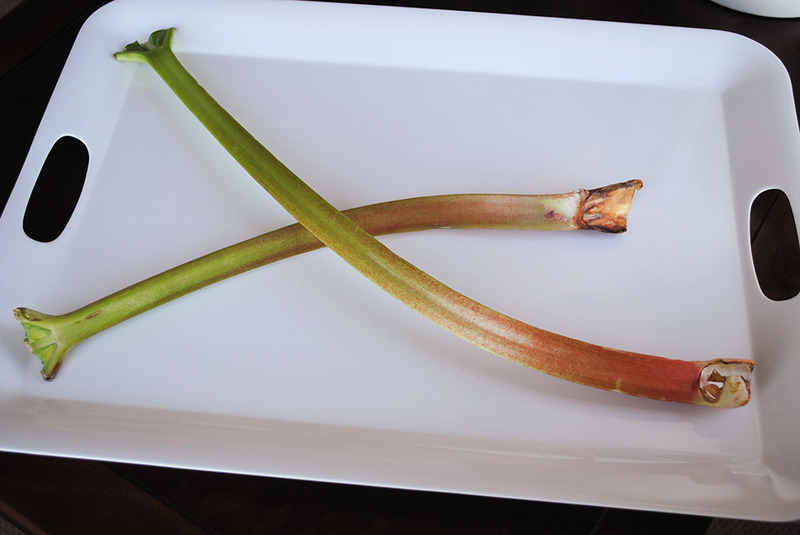 When the fruit ripens, it splits open, revealing the seed. Compared to other nuts, pistachios have one of the highest amounts of protein and fiber. They also contain important vitamins and minerals including copper, manganese, phosphorus, potassium, Vitamin A, thiamine, and Vitamin B-6. 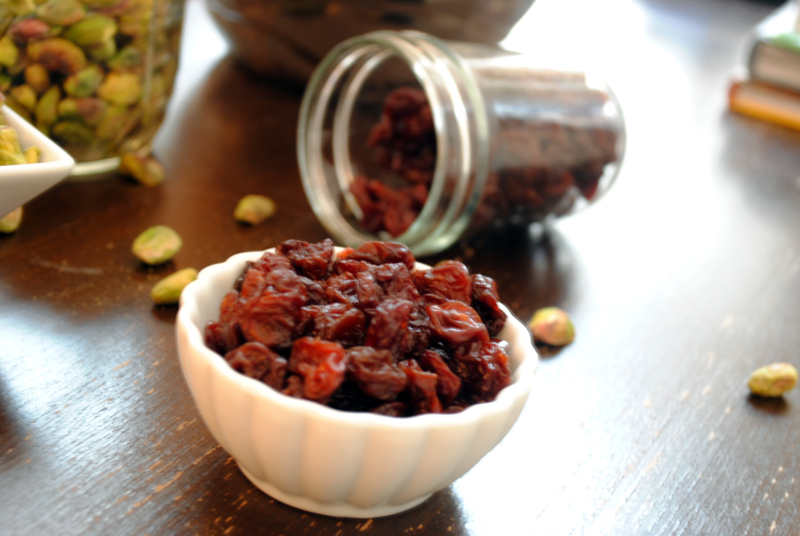 Dried Cherry: The cherry tree was named after the Turkish town of Cesarus, and is said to date back to 300 BC. Cherries come in two varieties: sweet and sour, both of which can be dried and eaten as a snack or used in baked goods. The red pigment in cherries, anthocyanin, is being studied for its antioxidant properties. I was surprised to see that Culinary Artistry does not list cherries and pistachios as a common flavor pairing. In my opinion, they are quite a complimentary pair. 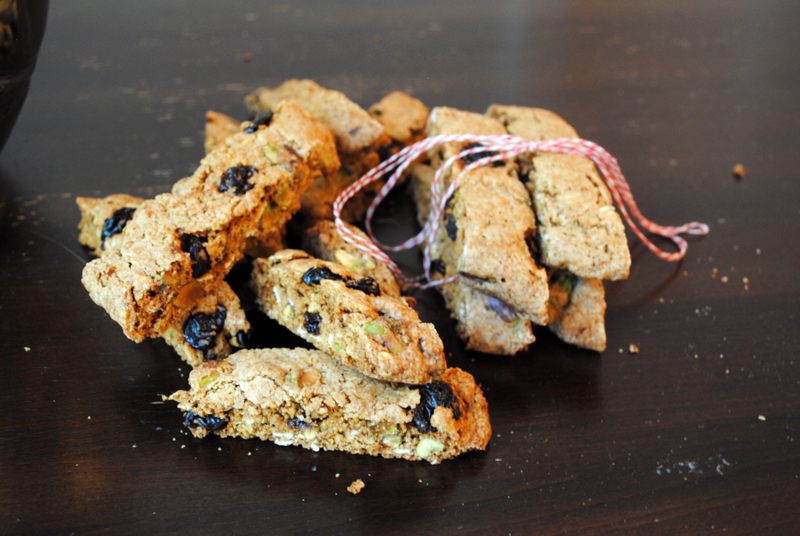 In addition to the lovely flavor combination of pistachios and cherries, these biscotti have a hint of orange due to a little bit of zest added to the batter. I love the subtle complexity that this hint of citrus provides. 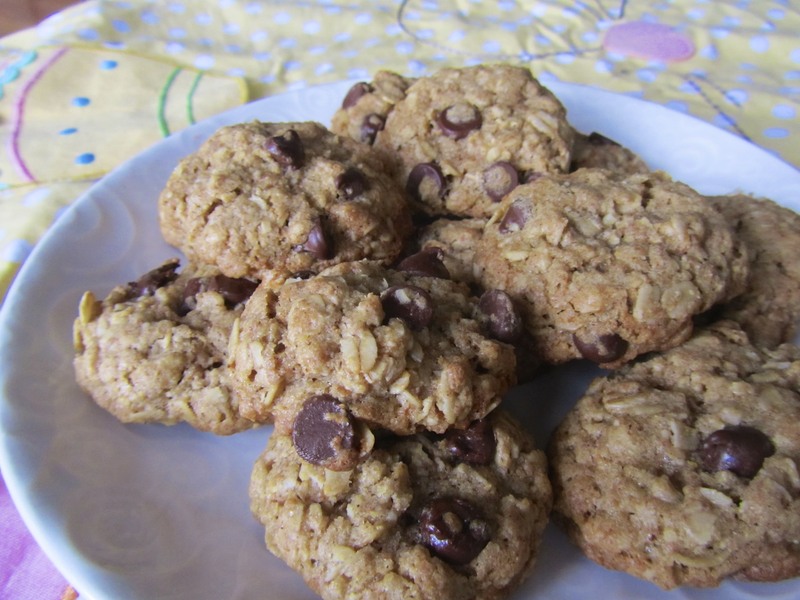 It keeps the biscotti feeling light and refreshing, while the whole wheat flour and oats also ensure that they are slightly heartier and more filling than the average baked good. Ready to be baked again! Preheat oven to 350°. 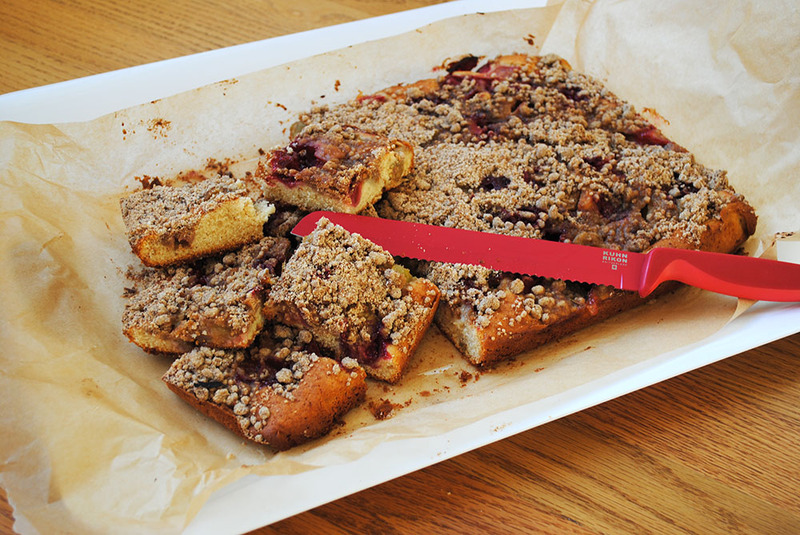 Line a large rimmed baking sheet with parchment paper. Combine first 6 ingredients in the bowl of a stand mixer fitted with a paddle. Blend on low speed for 30 seconds. Meanwhile, in a separate bowl, whisk together eggs and next 3 ingredients. Add egg mixture to flour mixture; beat on low speed until combined, about 1 1/2 minutes. 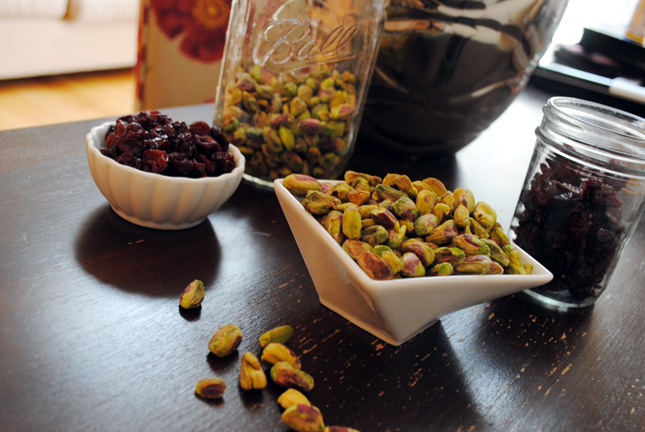 Fold in cherries and pistachios. Transfer dough to a lightly floured surface; divide in half. Using floured hands, shape each dough half into a 16″-long log. Brush off excess flour; transfer logs to prepared sheet, spaced 5″ apart. Flatten each log into a 2″-wide strip. Bake, rotating sheet halfway through, until browned and set, about 30 minutes. Transfer to a rack; let cool for 15 minutes. Reduce oven to 250° and arrange 1 rack in top third of oven and 1 rack in bottom third. 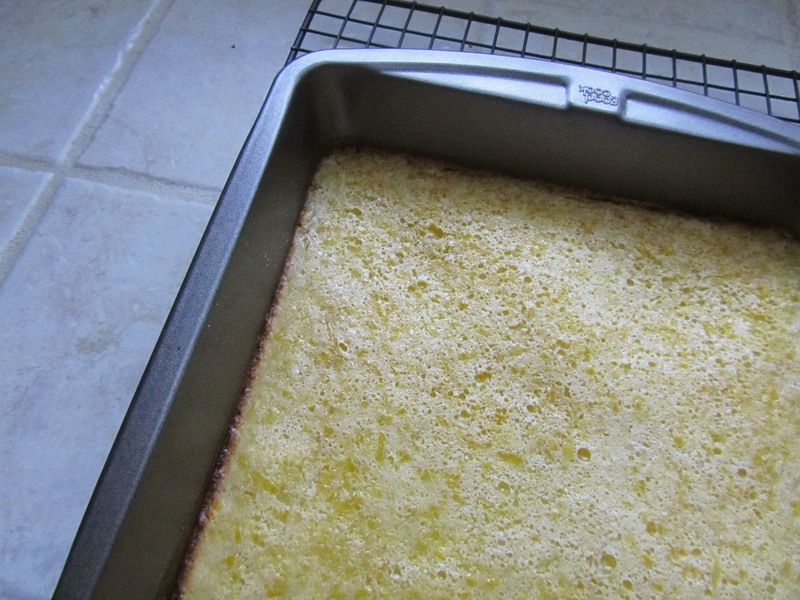 Line a second baking sheet with parchment paper. Transfer biscotti to a work surface. 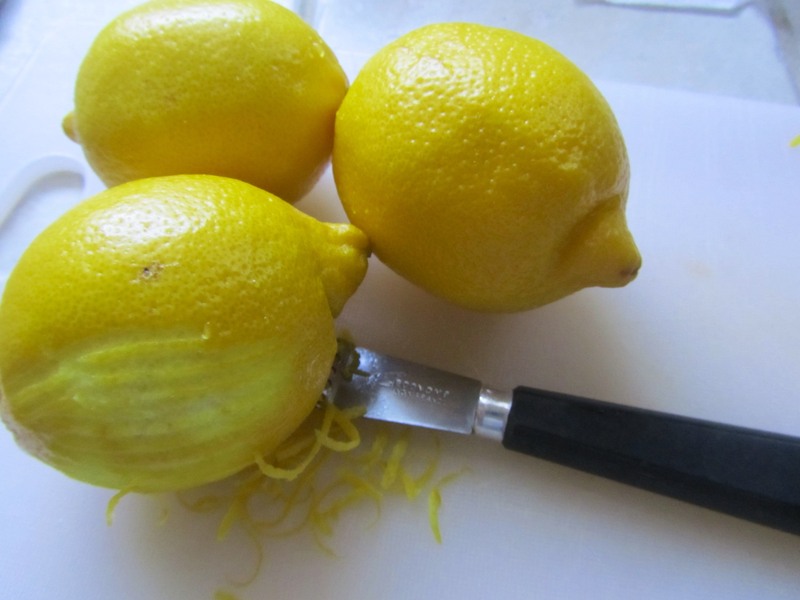 Using a serrated knife, cut each strip diagonally into 2/3″-thick slices. 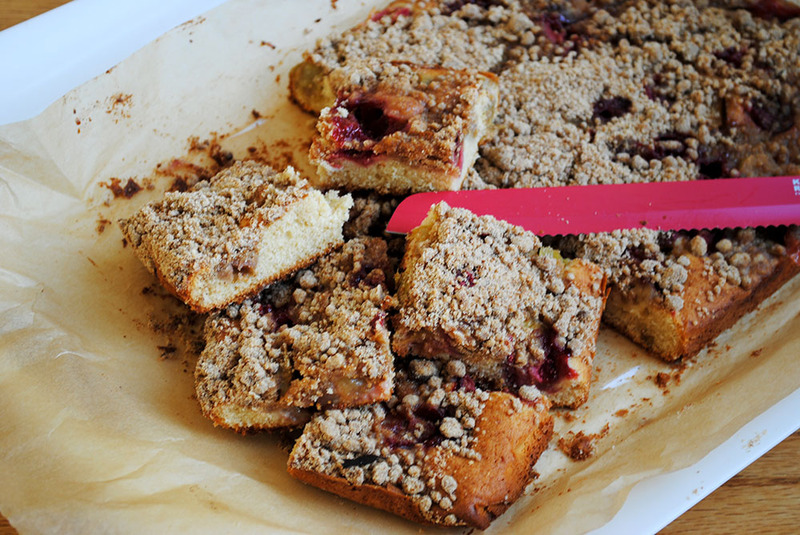 Arrange slices, cut side down, on baking sheets. My only complaint against homemade biscotti is that they have to bake for quite a long time, so you have to plan ahead when making them. However, the hands on work is simple, so they’re perfect for making on a lazy Saturday afternoon. I’ll be making more soon, potentially dipped in chocolate ;-). 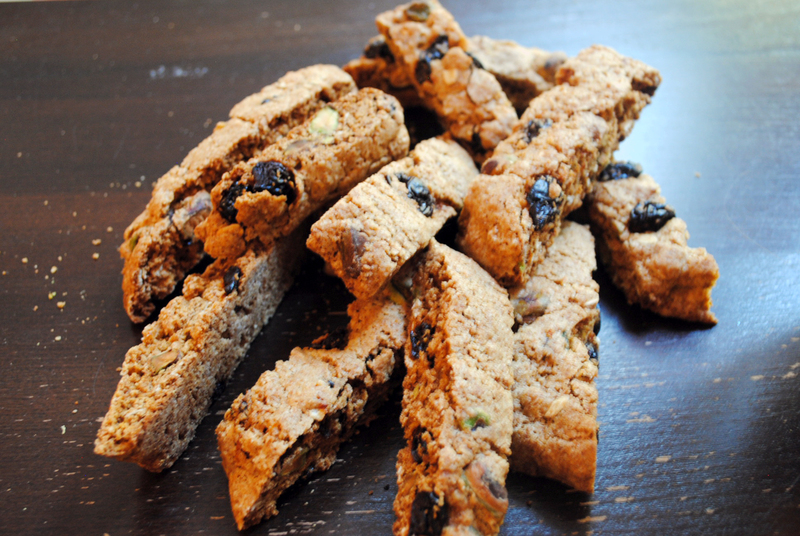 Do you like biscotti? Any favorite flavors or drinks to dip them into? In two weeks, we will be migrating to wordpress.org! If you subscribe to our blog through wordpress.com, it will no longer show up in your feed once we make the switch. To keep getting updates of new posts, subscribe to our RSS feed, or follow us on Twitter and/or Facebook. Thanks for following, and we hope you will stay with us! While Lindsey and I were on hiatus for the holidays, I was shockingly lazy. In a week and a half, my only exercise was one (ONE!) walk. My usual physical activity was replaced by lots of kitchen activity! 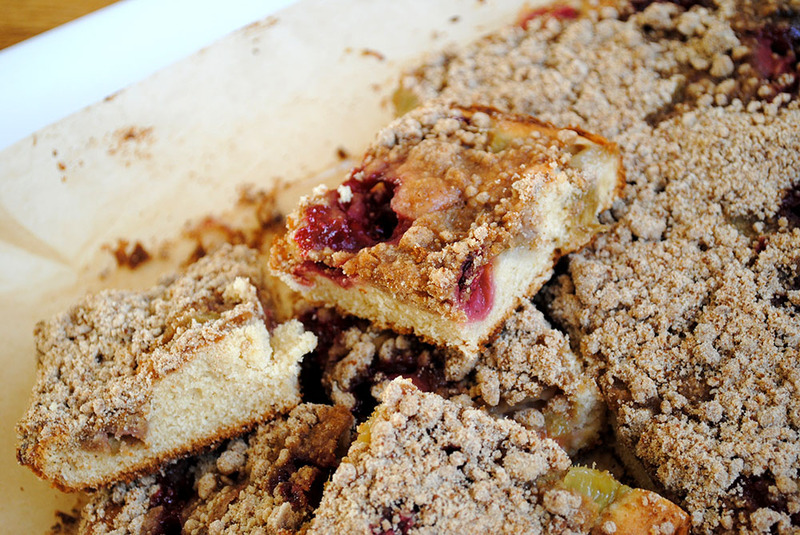 For this WIAW post, I’m sharing some of the best dishes I made and ate while on vacation. After my matinee performance on Christmas Eve, I hopped on a plane to Southern California to spend Christmas with my aunt, uncle, and parents. Shortly after walking in the door, my uncle handed me a Cranberry, Gingerly cocktail. YUM! I have a bit of a ginger obsession, so this delightful concoction with ginger beer, ground ginger, and a garnish of crystallized ginger was right up my alley. It was also a fun, festive shade of red. Great way to kick off the break! Christmas morning began with coffee and mimosas. After opening presents, we sat down for an delicious brunch. My mom and aunt had prepared a Sausage, Fontina, and Bell Pepper Strata the night before, so we just had to pull it out of the refrigerator and bake it in the morning. The creamy fontina cheese balanced the spicy Italian sausage wonderfully. It was a delicious, savory dish. We can’t have savory without sweet, so we also prepared Maple-Poached Pears with Ricotta and Pistachios. These tasty pears could be served as a dessert as well. They were so good! The crunch of the pistachios was a nice contrast to the soft pears, and the ricotta kept the dish from being too sweet. I will definitely make these again. With beautiful food and beautiful weather, our table for Christmas Brunch looked lovely! My main contribution to Christmas Dinner was a Gingerbread Layer Cake with Candied Kumquats. I think I may need to bake this cake annually. It looked great, and tasted even better. The cake was moist and full of flavor. The spices came through nicely. The cream cheese frosting included a bit of caramel, so it ended up being a lovely cream color. It was a sweet and creamy, and complemented the ginger and molasses flavor of the cake well. The candied kumquats were difficult to prepare (Thanks Mom and Aunt Kris! ), but were delicious! We used the leftover kumquats to top off a fruit salad the following morning. My parents and I came home to Texas a few days after Christmas, and were later met by my sisters and their husbands. Before they arrived, I met some old friends for a coffee date. Someday I want to be able to make latte art that looks this good! Props to the baristas at Buon Giorno for making this lovely latte. The first morning the whole family was home, we did Christmas Round 2, complete with another Christmas brunch. We prepared another strata, this time using broccoli, red pepper, mushrooms, and bacon. 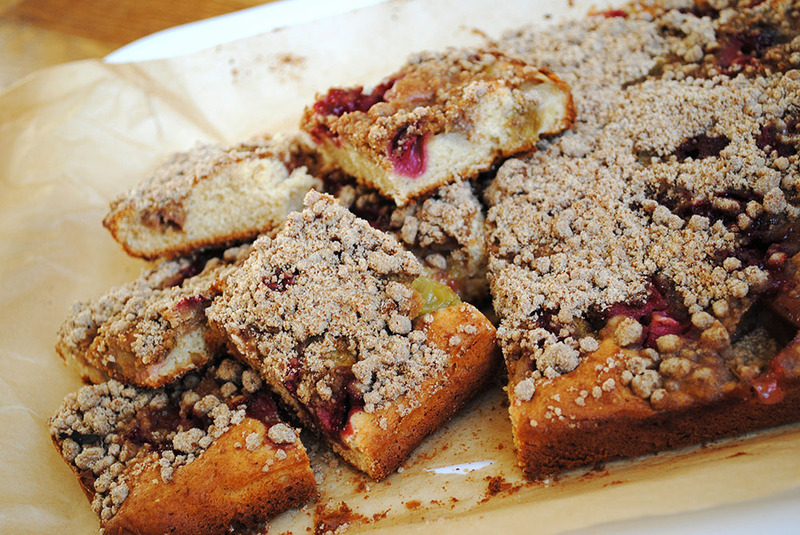 We served a fruit salad and sweet breads with it. Lindsey and I each prepared a bread the evening before. She made Banana Bread, and I made Spiced Pumpkin Bread, which I modified to make a bundt instead of 2 loaves. That evening we had a blast at our annual holiday party. As usual, we prepared Caprese Sticks for our guests to munch on. We enjoyed leftovers and what Lindsey referred to as “the obligatory Mexican meal” for the next couple days. The last night the sisters were in town, we had a special New Year’s Eve dinner. Lindsey made a delicious Roasted Parsnip Soup with Walnut Pesto for the first course. We also ate roasted chicken with mushroom gravy, roasted vegetables, and a potato medley with rosemary. I had so much fun with my family, and loved having the opportunity to cook together again! It was the perfect way to wrap up the rollercoaster year of 2012. 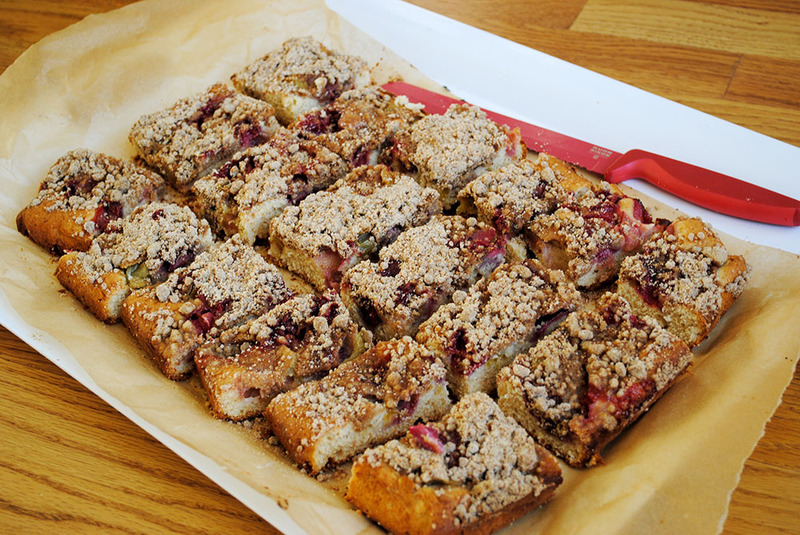 I look forward to sharing more good food with good friends in 2013!